Anyone who wants to improve the air moisture around their living space needs to get knowledge of the units used for measuring the humidity level. Basically, there are 2 types: Hygrometer and Humidistat. Understand about defines as well as how difference of both types will allow you to know what exactly you need are and also be able to choose the suitable device. This instrument is also used with the purpose of measuring the moisture level, but it is not the only. Another benefit of it is controlling the humidity in the room by adding more moisture to the air or removing some out of the space. By this concept, the device is not sold just on itself but usually together with other control devices that enclose it. It is based on the relative humidity, not the temperature and also used with a number of tools such as Humidifier, Dehumidifier and microwave ovens. Even though this electronic device is rather expensive than the hygrometer, people often choose to use it because it is worth the investment. Too much humidity has the same consequences with the case of too little moisture. Note: If you want to know whether in a determined space, you need to place a humidifier/ a dehumidifier or not, you should choose a hygrometer. If you are looking for a device that is not only measuring the level of moisture but also controlling it, a humidistat is a perfect choice. A hygrometer is an instrument that is used for measuring the moisture level in a room. It is usually based on some factors such as temperature, pressure, mass or mechanical or the electrical change in the material when the humidity is imbibed. After the calibration and calculation, the level of moisture in the space will be release through these measured qualities. In the past, people usually used the classical hygrometers such as metal – paper coil type, hair tension hygrometers, Psychrometers (Wet and Dry Bulb thermometer) and chilled mirror dew point Hygrometers. In the modern life, the developed technologies allow people to use many advanced tools like capacitive hygrometer, resistive hygrometers, thermal hygrometers, and gravimetric hygrometer. The hygrometer provides many sizes as well and you can choose to buy due to your favorite and demands. If you want to get a quick readout, you can purchase the instrument that can place on the shelf. If you would like to get a smaller unit that is run by batteries, you absolutely would find one for yourself. 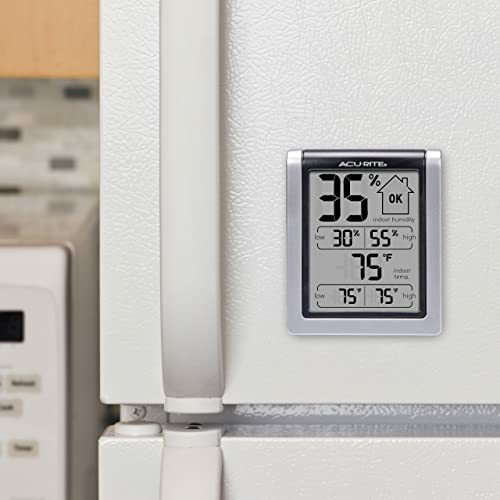 There is just one thing you need to keep in mind is that the hygrometer is just used for measuring the humidity level, but not for controlling it in the room. When the moisture in the air is high, it means that there is more heat contained in it. This makes the air conditioner have to work harder as on the one hand, it needs to remove all the humidity from the air and on the other, it also combat the warm air to the space. On the contrary, in the winter days, the weather is colder, the air is also drier. This makes the heater bring into play all of its efforts to balance the moisture because too low humidity cannot hold the heat, which means your room will be cold and it is not good for your health. These instruments not only play the essential roles in maintaining the moisture in the room stably, but also help you to save a big amount of money and reduce the electricity bill every month. Besides, it keeps your health always in good way and has the ability to avoid many allergies or sickness. While the damp air makes you easily catch many diseases caused from bacteria or virus growth in the air, the dry air makes your skin dry and the same thing with your throat and sinuses. Just a small action of keeping an eye on the temperature as well as the humidity in your house, you can control how cool or how hot of your living space. Get knowledge about the differences between Hygrometer and Humidistat, 2 types of measuring instruments is not only good for your health, but also for anyone else living in your house. When will you need a Dehumidifier?